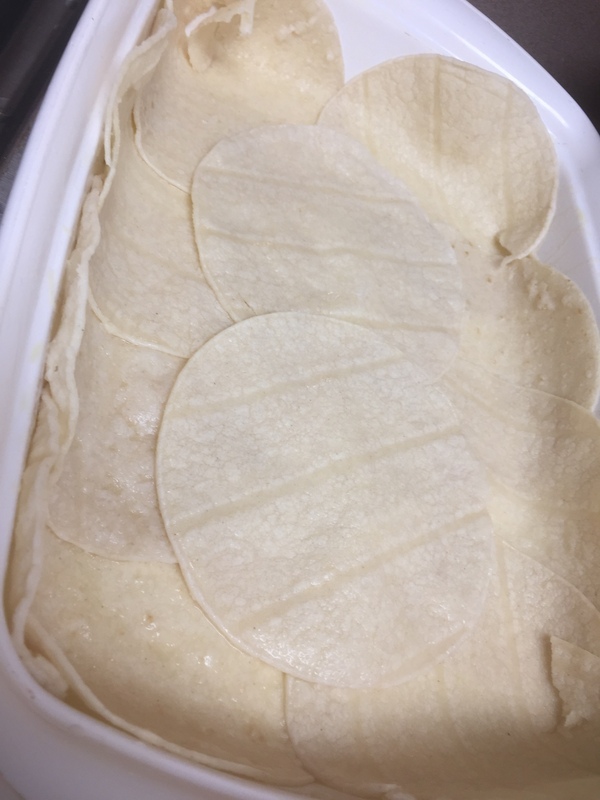 The first layer is soft corn tortillas. Be sure to cover the sides of the dish. That’s what I thought when I read the text message sent to me by a friend. I’d never heard of “Mexican lasagna,” but the ingredients and pictures intrigued me, so I decided that I’d try my hand at it. After all, I do enjoy cooking, because for me, it’s a creative outlet. And besides… who DOESN’T like eating, eh? Layer as you wish. But first place a layer of sauce atop the soft corn tortillas, followed by the meat. Seen here, the pinto beans with sausage atop a layer of vegetables (onion, olives, tomatillos, salsa verde, tomaotes, bell pepper, cilantro, etc.) and cheese. Mustn’t forget the Pepper Jack cheese! And, like most recipes, I make it my own, because as I see it, recipes are essentially broad guidelines, rather than precise and exacting hard-and-fast rules for cooking or preparing any dish. Top with crushed corn tortilla chips before adding the next layer. So, I set off to procure the ingredients which I didn’t have on hand, purposely omitting any ingredients which I didn’t think “fit,” and adding ones which I thought would accentuate the dish. Be GENEROUS with the veggies and other ingredients. DO NOT BE STINGY!